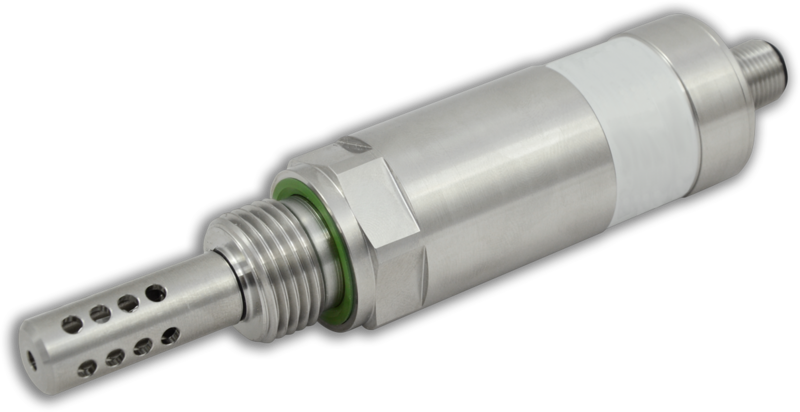 The Trident WM800 sensor is a real-time, in-line water-in-oil sensing technology for monitoring water contamination levels in lubricants, hydraulic fluids, and fuels. Water is one of the biggest threats to a lubrication or fuel system. Water contamination in oil promotes oxidation, microbial growth, corrosion, wear, sludging, and foaming. In fuel, water can lead to microbial growth, poor combustion, and ice formation in supply lines or tanks. Minimize the risk of moisture related damage through active monitoring with the Trident WM800. The Trident WM800 uses a capacitive relative humidity sensing element with integrated temperature sensor. By immersing the sensing probe directly into the fluid stream accurate measurements and fast response time are achieved. The device features a compact, easy-to-install form factor that includes integrated acquisition and processing electronics. Water activity (aw) and temperature are reported through a 2-wire RS485 interface with Modbus RTU protocol or via two 4-20mA analog outputs.